→The Amazing Crow Or Cat Illusion! The Amazing Crow Or Cat Illusion! I discovered this picture on Twitter, and it was getting viral like crazy. 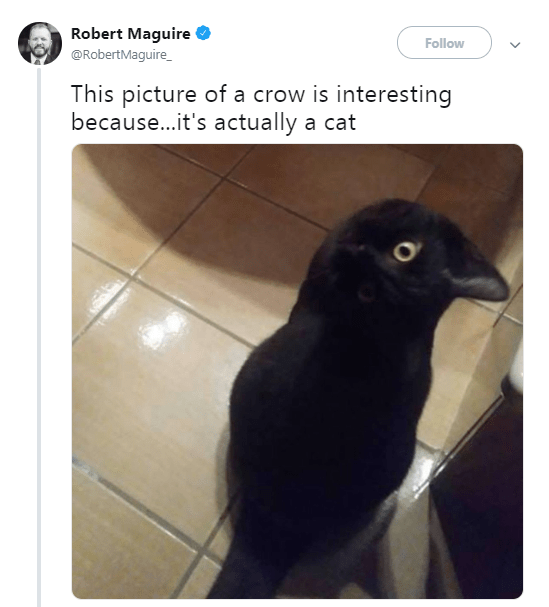 Because what looks like a crow is actually a cat. I scratched my head a lot, and then my daughter joined in. She saw the cat! This is a good metaphor for ideas hiding in plain sight. While everyone sees the obvious, a little change of perspective, a little turn of the head reveals the other possibility. If you see the cat, do comment with a big YES in the comments. And till then, keep scratching your head! Why Do Men Wear Pink Pants? Ganapati Special: What If The ATM Machine Gives You A Modak, Instead Of Money? Hypnotic Storytelling: How To Spellbind Your Audience! It’s Difficult To Draw An Original Rose!